Learn the Yarn Dye Techniques that are used by all the Pro’s and you can use your stove and ingredients that are in your Pantry. Be sure to watch the video tutorial now. If you’re looking for that perfect color yarn to use in your next project, you need not look further than your own kitchen. Dyeing your own yarn isn’t complicated and there are so many ways you can do it. Just take a look at all of the incredible Yarn Dye Techniques we’ve found for you below. 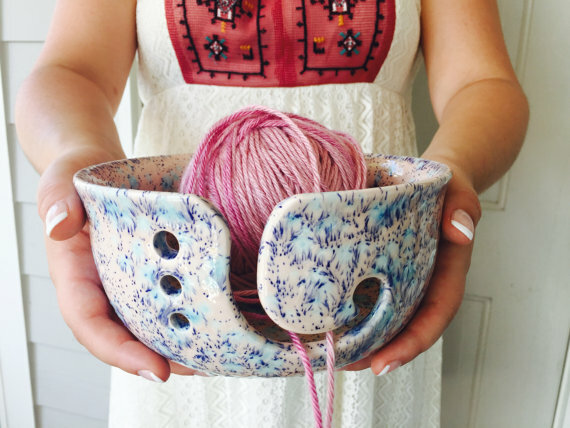 Achieve amazing results and complement it with a yarn bowl like the one above from Etsy. While we are on the subject of Etsy, this is an excellent craft that can translate into an income. Yes, you can turn your hobby into a money making cottage industry. On Etsy many makers have a readymade market. If you are looking for a home business opportunity, this may be just what you are after. 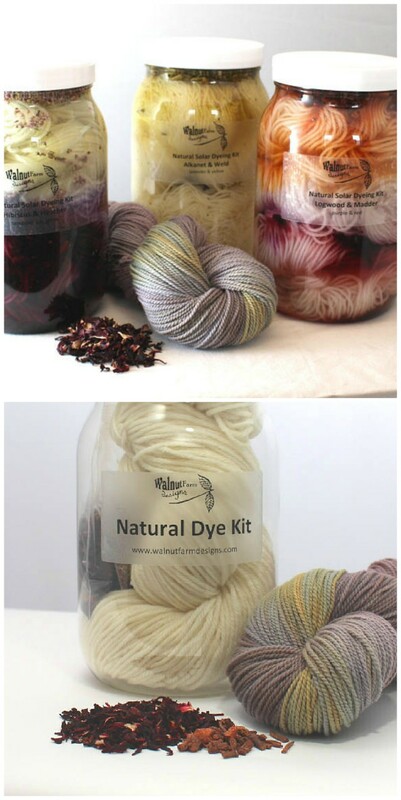 You can also purchase DIY Kits like the one above that have lots of nice natural dyes to play around with. In this video from Etsy expert Kim Hall, she shows us how to make three different natural dyes using ingredients from your kitchen. Onion skins make a tan color, Turmeric makes a brilliant yellow and the cabbage produces a beautiful violet. Did you know you can dye your yarn in the microwave? It’s as easy as steaming a bag full of veggies! Angela from The Yarn Bucket uses food coloring as a dye in a ziplock bag and soaking it in the dye solution. She then microwaves it in two-minute cycles until all of the dye is absorbed, and the result is incredible. You can see the results on her website. One widely-used yarn dye technique is using Kool-aid as a dye. The strong dyes used in the drink result in beautiful colors. You can even mix to create additional colors. FiberArtsy have achieved some exceptional results and you can see the technique on their website. 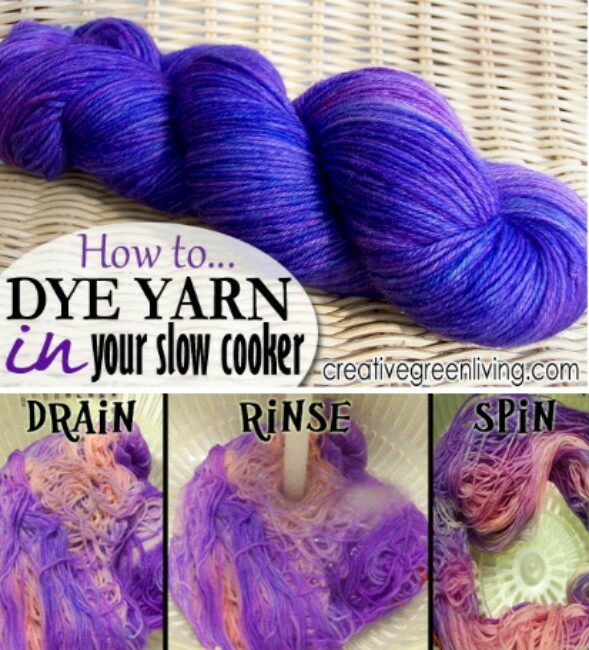 Carissa from Creative Green Living shows how to dye yarn in her slow cooker. It’s a great technique to use when you don’t want to stand over a hot stove. It’s as Carissa puts it, the “lazy” way to dye yarn beautifully. You can set and forget for a few hours. She has a tutorial on her website. 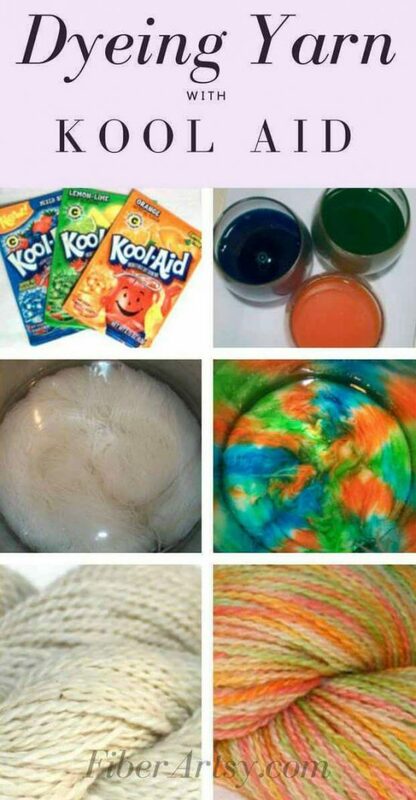 Here is a fun way to dye your yarn, which began as an experiment from The Weaving Loom. If you’ve ever done the ‘paper towel experiment’ in school that makes colored water travel from one jar to another, then you might recognize how this technique works. Different parts of the yarn hank are put in jars with different colors. Eventually, the yarn absorbs the colors, making a beautiful ombre-type yarn. There is a tutorial on their website. 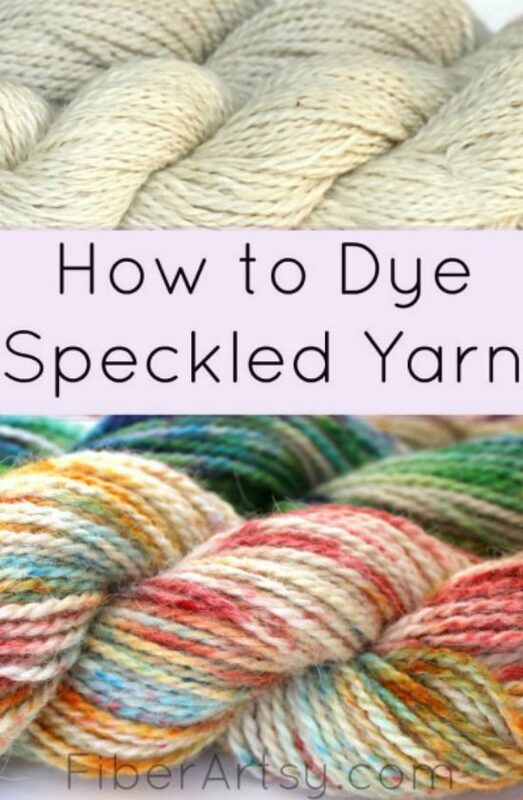 Making Speckled Yarn in this post really looks like a lot of fun! Sprinkling yarn with Koolaid, then mixing it up is the basis of the technique, and it’s not difficult to do at all. This technique is created in a baking dish, then heating it either in the oven or in your microwave. The end result is absolutely gorgeous! You can see the full tutorial on their website. This post from Crave The Good is featured on Instructables and results in a wonderful ombre yarn. The finished product will give you a beautiful, gradient look. You can get creative and achieve all sorts of glorious colors. You can see the full post on the website. The incredible thing about using black beans as a yarn dye is that you can end up with many different variations. By adding different ingredients like baking soda for example you can manipulate the results to achieve green tones and other effects. See the results here. 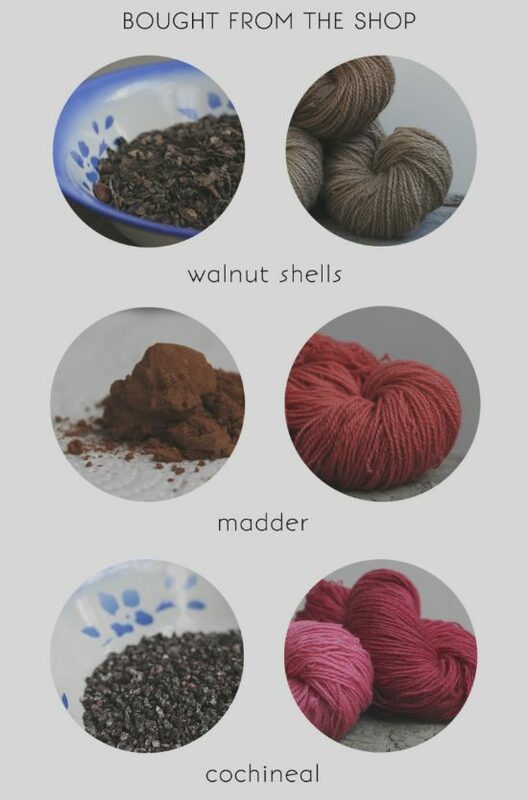 If you want to see how various natural dyes will look on your yarn, this graphic from The Easy Blues is great. This blogger shows the results of the different ingredients she uses. The chart above uses spices and vegetables and you can see the colors are stunning. We’re sure that you will play around with items to come up with your own unique results. Walnut shells, madder, and cochineal are other dye mediums to use. Just look at those amazing results. You can see the article on their website. Be sure to check out all the gorgeous Yarns for more inspiration on Etsy here.